On pp. 30-31 of the Complete Lyrics of Irving Berlin there is a long preface to the lyrics of Alexander’s Ragtime Band. I’ll quote the beginning and a couple of other fragments. Berlin was not impressed by it when the melody first came to him. In fact, after playing over a few times on the piano, he did not take the trouble to note the melody on paper. He might never have completed the song had it not been for a trip to Palm Beach, Florida which months later he arranged to take with Jean Schwartz and Jack M. Welch. Just before train time he went to his offices to look over his manuscripts in order to leave the best of them for publication during his absence. Among his papers he found a memorandum referring to Alexander, and after considerable reflection he recalled its strains. Largely for the lack of anything better with which to kill time, he sat at the piano and completed the song. No one liked it in that form so I set a lyric to it. It then lay on the shelf for some time as everyone thought the chorus was too long and the range to large for the ordinary voice. However, Emma Carus liked the song and introduced it in Chicago. It was a big hit for her and before long many other vaudeville acts were singing it. The song’s popularity was far-reaching. I took my first trip abroad in 1912 and was delighted to hear it whistled by a newsboy as I stepped off the train at the station in London. I soon realized how big a hit “Alexander” was in England. Within a year or so it became an international song hit and was translated in almost every known language. 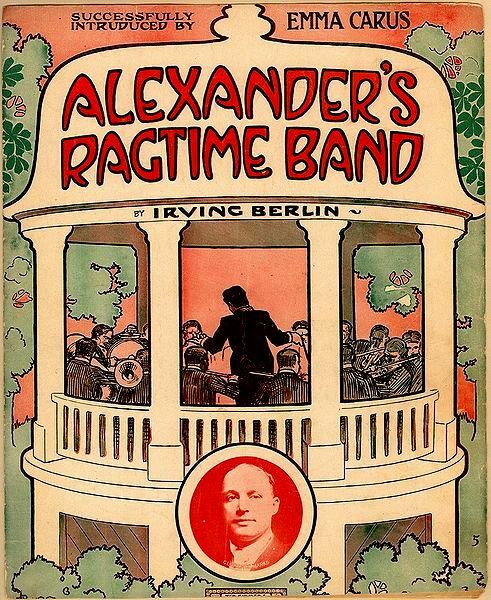 Much has been written about the fact that Alexander’s Ragtime Band is not itself an example of the ragtime musical idiom. It is a march. However, it was so infectious and popular that it helped, by association, to revive interest in ragtime, which had evidently been waning in popularity since its heyday around the turn of the century. Controversy also surrounded its origin; it was suggested that the song was written not by Berlin but by the black pianist Lukie Johnson, which Johnson himself denied. Later, Scott Joplin claimed Berlin had stolen the music from his opera Treemonisha; the two men do appear to have met, but that is as far as it went. Treemonisha was registered for copyright two month’s after “Alexander’s…”, but this did not deter Joplin, who died in 1917 convinced his work had been plagiarized. Towards the end of his life, Scott Joplin suffered from a degenerative illness which affected his mental powers, so the assertion must be treated with caution. His biographer Edward Berlin has made a careful study of this claim, but although, he says, there are similarities between “Alexander’s…” and “A Real Slow Drag”, this is hardly surprising, as a great many songs and instrumentals were written in the same style at that time. 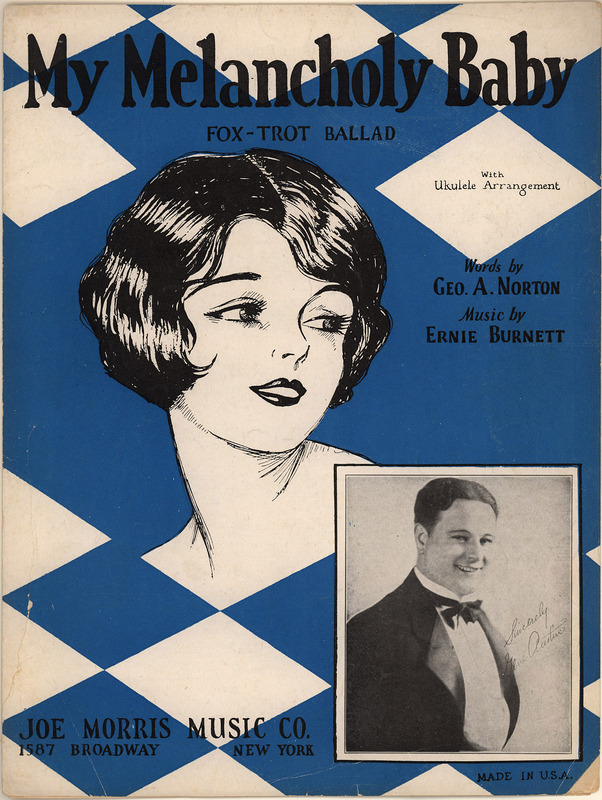 According the Complete Lyrics, the most popular early recording was that by the renowned comedy team of baritone Arthur Collins and tenor Byron Harlan. Other important 1911 recordings included those by Billy Murray, and the Victor Military Band. It was later covered by many top artists including Bessie Smith, the Boswell Sisters, Louis Armstrong, Bing Crosby and Connee Boswell, and Ray Noble. The song is memorialized on screen by Alice Faye in Alexander’s Ragtime Band (1938), and by Ethel Merman , Dan Dailey, Donald O’Connor, Mitzi Gaynor and Johnnie Ray in There’s No Business Like Show Business (1954). 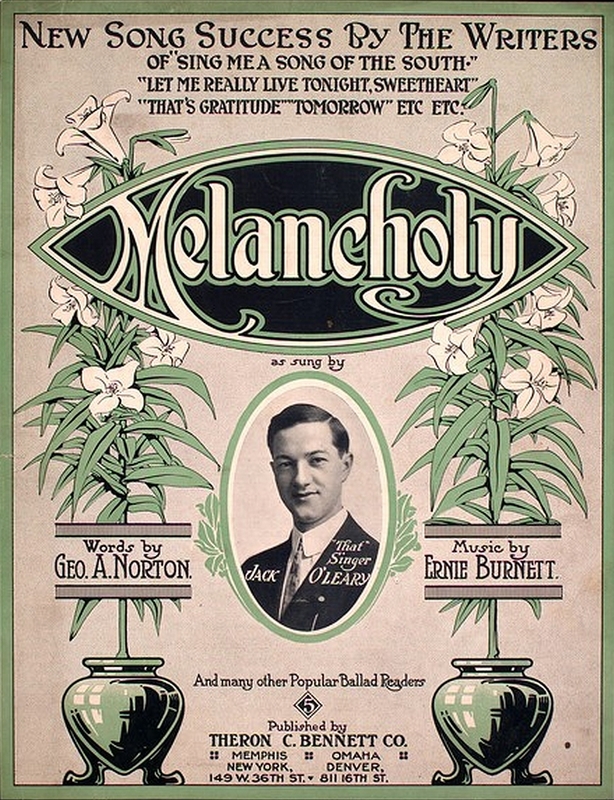 This song was likely introduced by vaudeville performer Jack O’Leary, known as “That Singer,” who is pictured on the original sheet music. 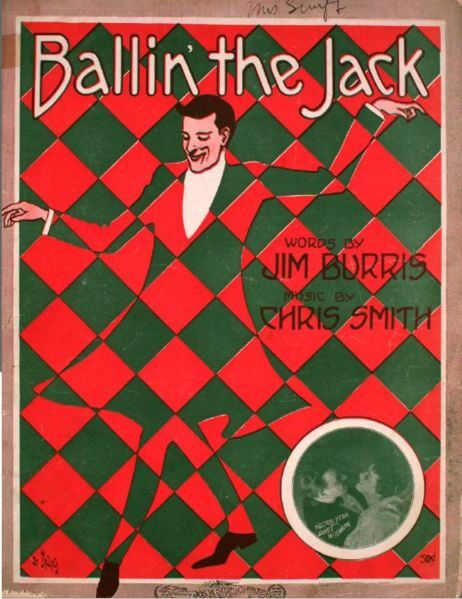 A 1915 recording by vaudeville stage actor/vocalist Walter Van Brunt became a popular hit. During 1912, William Frawley — later of I Love Lucy fame—- was the first person to perform the song publicly, in the Mozart Cafe in Denver, Colorado. Frawley told this story during a May 3, 1965 appearance on the TV game show I’ve Got a Secret. 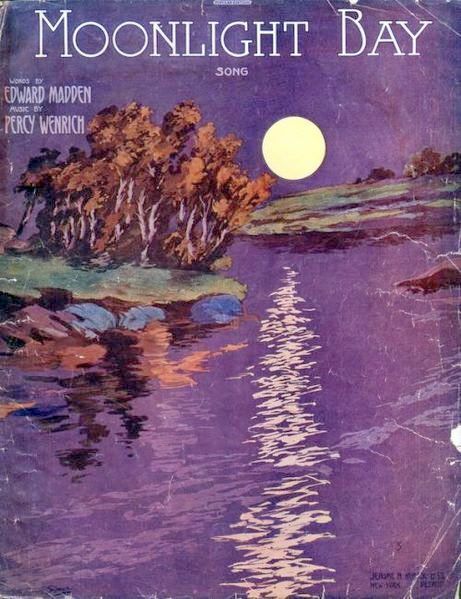 Despite its published title, in conversation it often is referred to simply as “Melancholy Baby,” without the word “My,” including by Frawley himself in the above mentioned appearance. Al Bowlly had a hit with his 1935 recording. The video below features a live performance, with piano accompaniment, filmed while on a holiday in 1936. 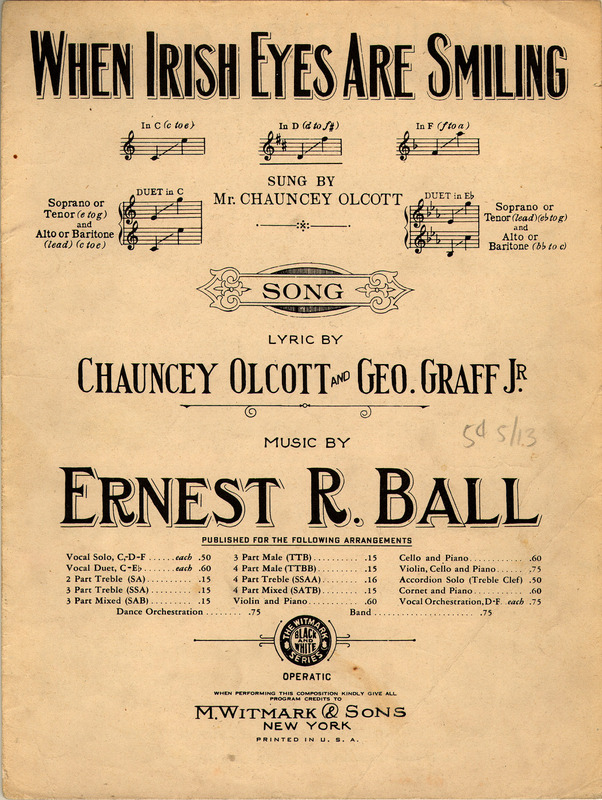 When Irish Eyes Are Smiling (Ernest Ball, Chauncey Olcott, George Graff, Jr.) The song was composed for Olcott’s original stage production, The Isle O’ Dreams. He sang the song in the show. 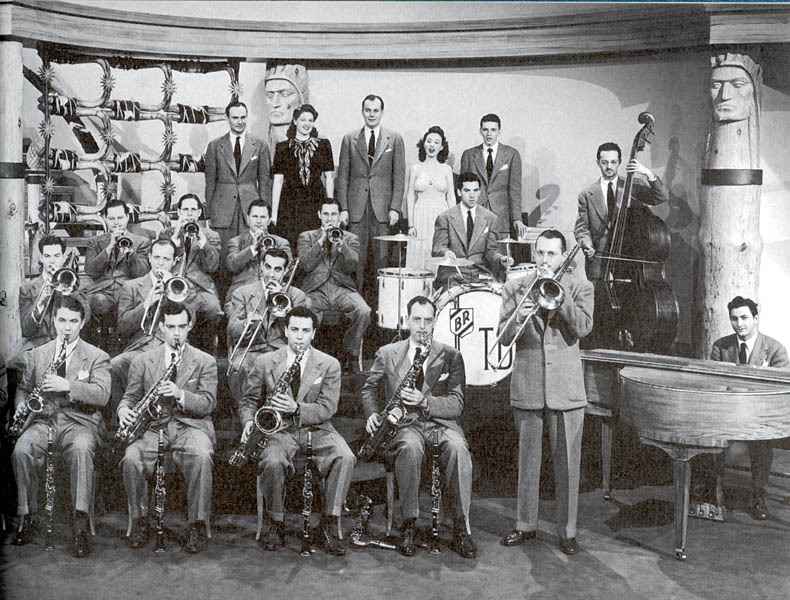 Below: John McCormack with orchestra. Originally issue circa 1923 according to the youtube provider. Frank Patterson (October 5, 1938 – June 10, 2000) was an internationally renowned Irish tenor following in the tradition of singers such as John McCormack and Josef Locke. He was known as “Ireland’s Golden Tenor”. Ballin’ the Jack (Chris Smith, Jim Burris). The song was the catalyst for a popular dance of the same name. The song and dance were performed in For Me and My Gal, the 1942 movie starring Judy Garland and Gene Kelly. B-10450-A). Release as a 78 rpm single with Don’t You Leave Me Here as the B-side. Both sides are available in .ra file format at at redhotjazz.com. 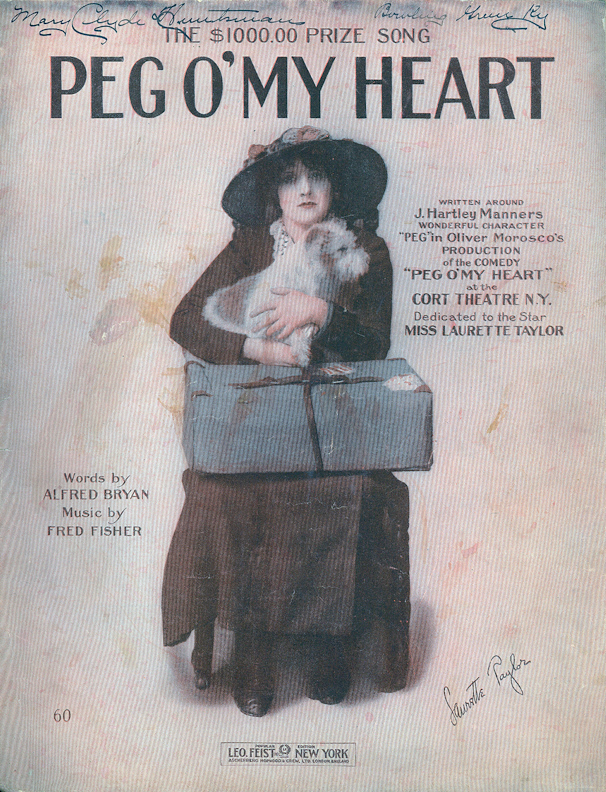 You Made Me Love You (James V. Monaco, Joseph McCarthy) Introduced in the Broadway revue The Honeymoon Express, 1913. Liza Minnelli sings You Made Me Love You for the cast of the Tony Award winning Broadway musical, THE LIFE, starring Sam Harris. The Broadway production, directed by Michael Blakemore, opened on April 26, 1997 at the Ethel Barrymore Theatre, where it closed on June 7, 1998 after for 466 performances and 21 previews. I Wonder Where My Easy Rider’s Gone? (w. m. Shelton Brooks) is a ragtime/blues song written by Shelton Brooks in 1913. 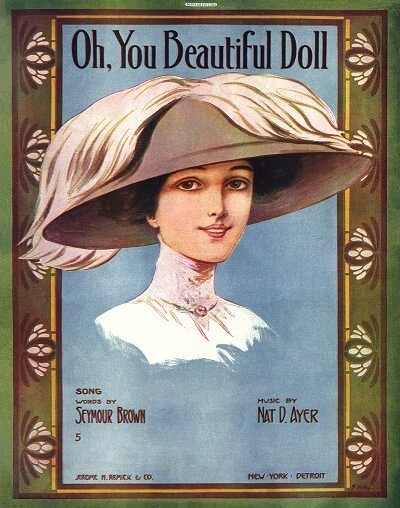 A response to the song was written in 1915 by W.C. Handy, “Yellow Dog Rag”, later retitled “Yellow Dog Blues”. Lines and melody from both songs show up in the 1920s and 30s in such songs as “E. Z. Rider”, “See See Rider”, “C. C. Rider”, and “Easy Rider Blues”.